The unique design for this piece came from Br. Gabriel Chavez, OSB, of Tpeyac Abbey, near Mexico City in the 1950’ and 60’s. This and others in a similar style are now made by a small group of Christian artisans outside of Cuernavaca, Mexico. 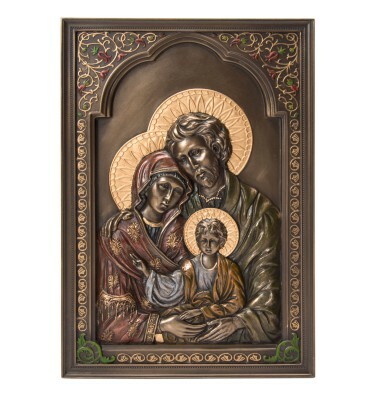 It is a simple and nuanced plaque depicting the Holy Family who are golden in color, with gold discs above their heads serving as halos. Mary sits on copper colored metal bench and touches hands with Joseph, while the Christ child stands in the middle center with a smile of beaming exaltation. 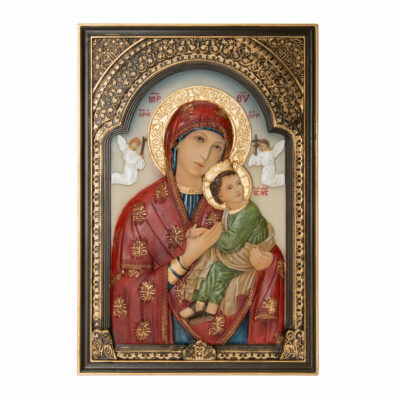 It is an eye-catching object of art that is ready for hanging in the kitchen, the bedroom, the prayer space, or elsewhere in the home. It has a humility about it that will remind viewers to have the same.